"Doesn't get much better than this !!!" "Great cigar with a great burn." "Good smoke on a rainy day." According to their mission statement, “Espinosa Cigars is committed to creating cigars of superior quality.” Their 601 Maduro is proof positive that Espinosa Cigars backs up their words with finely crafted products. 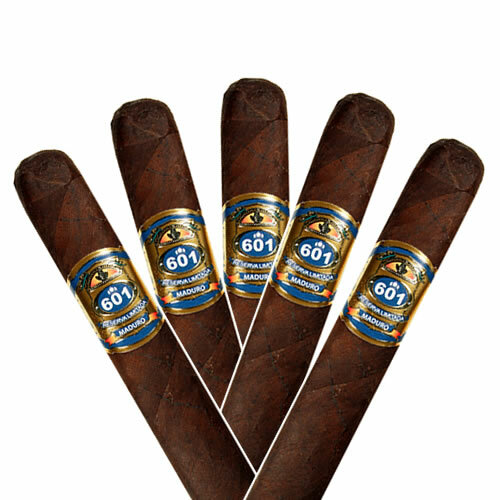 The 601 Maduro is a Nicaraguan puro that is made of perfectly aged, long-filler tobaccos, and wrapped in a rich, dark oily broadleaf maduro wrapper for a full-strength smoking experience. A full-bodied, hand-rolled cigar, the 601 Maduro has a well-balanced flavor profile that consists of sweet tobacco and is highlighted by an enticing aroma. Once you smoke the 601 Maduro, it won’t take you too long to realize why it was awarded the #6 Cigar of the Year spot by Cigar Aficionado in 2009. Made by Pepin Garcia in Nicaragua and distributed by Rocky Patel, the 601 brand has garnered a loyal following for its bold, rich taste. Both maduros and naturals are included in this sampler. Nicaragua has developed into one of the best cigar making regions of the world in the recent years. These are some of the best rated sticks from Nicaragua. Anonymous Do you have the Short Churchill coming soon? NeptuneCigar.com We're unsure. However, you may special order a box any time you wish. Call 1-800-655-3385 or email luzzie@neptunecigar.com with your special request. NeptuneCigar.com This sampler is packaged in a Neptune Cigar sampler bag with a Water Pillow humidifier. This is a very good tasting Cigar. It has multiple notes which includes a non over powering sweetness. Also it pairs very well with spice rum on ice or with a hint of coke soda. Love the 601 series all of them are good but blue has to be my favorite. Good draw,smoke,flavor. Mmmmm good!! Bought a box to try since it had a 91 rating. It had a even burn with a mild taste. I didn't find it to have much of an aroma. Would buy again if on sell. Nice sampler of the best selection of my favorites! Great after dinner smoke. Pairs well with some bourbon. Also great customer service from Neptune, as usual. I haven't bought this cigar for awhile, I was missing out. This cigar does everything well, and is priced at a very good price. Really nice. Very good purchase, especially to get familiar with 601. Another great smoke from AJ !!! i enjoyed the cigars in this sampler! This is the best cigar Espinosa has made. Beautiful stick with the blue and gold over the dark and oily maduro wrap. Excellent easy draw. Some uneven burning but would self correct. Cold draw tasted of coffee, dark chocolate, and earth. Smoke was similar with less earthiness and a more pronounced chocolate and dark tobacco flavour. Very pleasant smooth taste with lots of smoke and a solid medium to medium-full strength, leaving me a nice little nic buzz by the final third. Really enjoyed this one. Looked great in my humidor, felt great in my hand, burned decently, and tasted great. Would recommend and would buy again. Not bad for a box press. Easily one of my top 5 sticks. I didn't pickup much on the aroma , maybe my nose was off this day. The flavor is big with multiple notes, great after taste. It is a fine product. Bien fait, agréable, mais trop "artificiel"
Never heard of this cigar before coming to this site. Missed the review in Cigar Aficionado. Excellent Smoke, wish they made a larger one, and Neptune asssues the best there is always fresh. Never a problem. If you like a Fuente Maduro try this Blue Label 5 Stars Easy! I'm not a box pressed fan, but if I was, this would be a cigar to consider. Excellent construction, draw, and ash. Though I wouldn't buy a box, I'll keep a few on hand to enjoy from time to time. Great sampler and well priced. This was my 1st 601 Blue and I have to say it was an absolute delight to smoke this beauty that I am a little saddened that it was my only one. I only had to relight it one time which was a bummer, but it happens. The appearance was dark and oily a very good thing. I used my punch instead my cutter I prefer the punch to cutting which makes my draws so much better and with the 601 this was no different, this had an amazing draw. The burn as I stated above I had a little issue with, but only one re-light so that was ok by me. The aroma could be described as chocolate mixed with a leathery woodsy taste, but really got me was the smoke smell, after I exhaled I sniffed at the lingering smoke and swear I smelt nuts or almonds. It started out tasting very strong then it got more mild, maybe I was just getting used to it, but the strong taste came back before it ended. I would very much buy a box of these.